According to a report from Reuters, citing "four sources familiar with the matter", BlackBerry is working on an Android smartphone that combines a touchscreen with a slide-out physical keyboard. 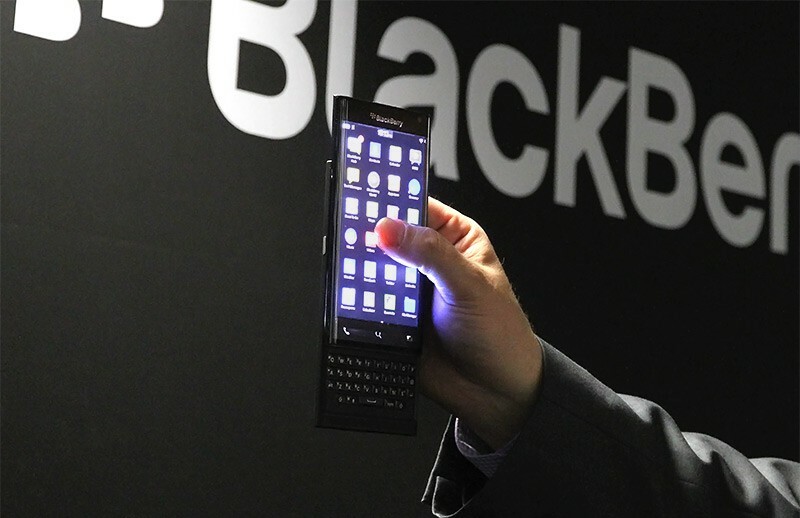 The device could be a variant of a prototype smartphone the company showed off earlier this year, which is seen above running BlackBerry's in-house OS. The company hopes that by releasing a niche Android device with a differentiating feature like a hardware keyboard, they will be able to claw back some of the market share they have lost over the past few years. Currently, BlackBerry commands under one percent of the market, and its phones running BlackBerry 10 simply aren't seen as attractive against iOS, Android and even Windows Phone devices. The use of Android on this rumored phone will also help BlackBerry transition from a devices company to a software and services company. BlackBerry hopes that their enterprise management system, BES12, will help take the company forward, and its ability to run on rival platforms including Android, iOS and Windows is key to its success. Reuters' sources say that by launching an Android smartphone, Blackberry would be "sending a signal to skeptics that it is confident that the BES12 system can not only manage, but also secure smartphones and tablets powered by rival operating systems." BlackBerry's first Android smartphone will also reportedly come with some BlackBerry 10's "patented features". The company has already announced that some of its productivity, security and communication tools will become available on other OSes including Android, so this could be what the sources were referring to. Despite this rumor, BlackBerry will "remain committed to the BlackBerry 10 operating system, which provides security and productivity benefits that are unmatched". The company declined to comment on its alleged plans to release an Android-powered device. I wonder when Blackberry will finally give up. Jos and Arris like this. Wait, Blackberry is still alive? I thought nobody bought those things. No kidding. The Passport and Classic only sold 8,000 units, it pains me to see them continuing to make hardware that we KNOW won't sell. I would love to see physical keyboards make a come back. While I've adjusted to touch keyboards I don't like them any more than I did 8 years ago. This is the smartest move Blackberry could make. We need a "Torch II" with a unified Blackberry messaging experience AND an immediate infusion of good apps. There's nothing to stop Blackberry from integrating their best-in-class security, either - they could work their sandboxing and partitioning magic on Android, a Linux variant, just as readily as they could on QNX. Regarding the keyboard, they need to leave enough room above the top row for human-sized fingers: this has been the downfall of nearly every QWERTY slider. And for GOD'S SAKE, Blackberry, don't forget the trackpad!! Its critical for a real "pocket office" device. I've been wanting a Droid 5 to come for many years.... I used to have a D3 and D4, and LOVED them. I was stupid and forgot they were in my pocket when washing clothes, and destroyed both of them. Then I bought a water-resistant phone, then another. I HATE not having a physical keyboard. I've been using touch keyboard for about three years now and STILL cannot use it as fast as I can a physical keyboard. I would love to see BB make a Android phone with keyboard, BUT.... I want it to slide out from the side, not the bottom of the phone, that is too small of a keyboard. There is rumor of a Droid 5 being made, same QWERTY keyboard but water resistant and wireless charging. Sounds like a dream come true to me if that actually happens, but I hope it at least has a 5" screen. What will BB do? Finally. It was about time. I wonder when Blackberry will finally quit. They have this never say die spirit. As for us the customers, we yearn to see their new technology.